Today's article finds that there's still some useful data to be drawn from 'just another' transit of Venus in 2012. 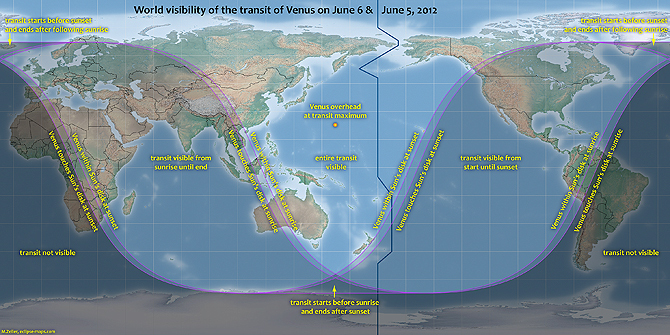 The 2012 transit of Venus will proceed for nearly 7 hours over 5 and 6 June (UTC). It’s not likely that we are going to squeeze a huge amount of ground-breaking science out of this event, which was closely monitored by 21st century technology the last time it happened in 2004. But Sigismondi argues that a more exacting observation of this transit should enable us to clean up some of the historical data from previous transits by kind of reverse-engineering some of the inherent inaccuracies that plagued earlier measurements. The point of such an exercise may become clear by considering a claim made back in 1979 that the Sun was shrinking – based on an analysis of 120 years of Greenwich Observatory solar measurement data. Apparently this finding has since been hijacked to support a young Earth hypothesis – as in if the Sun is shrinking so fast, then how can it possibly be billions or even millions of years old and yada, yada. Shapiro was able to quickly counter the shinking data finding in a 1980 publication (in Science), demonstrating that transits of Mercury data, going back to 1736, indicated that the solar diameter had remained constant to within 0.3 arcseconds. This was then followed up by Parkinson et al, also in a 1980 publication (in Nature), demonstrating that changes in the Greenwich solar data correlated closely with changes in instrumentation, atmospheric conditions and in the people taking the measurements (and thanks to Matt Tiscareno for this story). 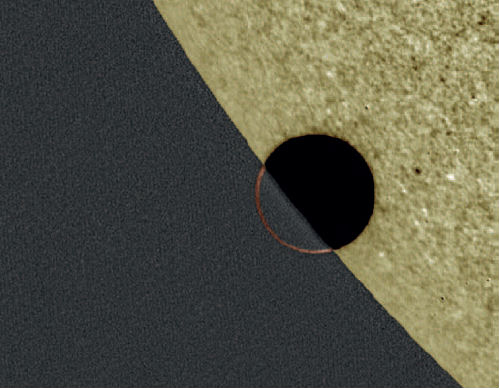 Anyhow, Sigismondi outlines how the solar diameter can be measured from the transit of Venus’ outline when it contacts each edge of the Sun – and then discusses a method whereby the ‘notorious’ black drop effect can be eliminated. 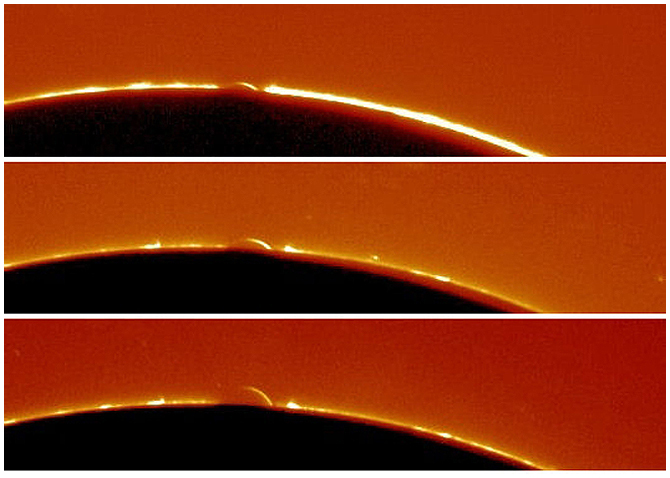 The black drop effect involves the black shape of Venus seemingly to elongate as it approaches the edge of the Sun – which had confounded all measurements taken prior to 2004. Transits of Venus generally happen in pairs separated by 8 years, with either 105.5 or 121.5 years separating the last of the pair and the first of the next. Apparently Kepler was the first person to predict a transit of Venus in 1631 – but he failed to predict that it would not be visible from Europe. So it fell to Jeremiah Horrocks and William Crabtree to make the first scientific observation of a transit 8 years later in December 1639. The next two were in June 1761 and June 1769, the latter famously observed from Tahiti by Lieutenant James T Cook (OK, kidding about the T) and then there were two more in December 1874 and December 1882. 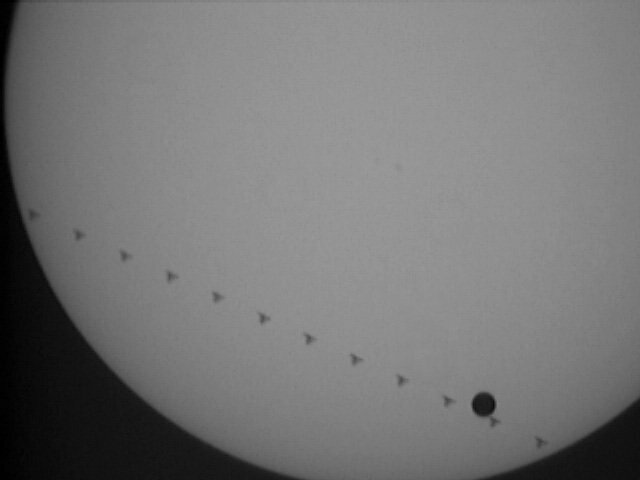 Then another 121.5 years passed until June 2004 – now to be followed by this year’s June 2012 transit, being the 7th ever scientifically recordeded transit. And BTW here’s an original drawing by James Cook of the June 1769 transit, showing the black drop effect. So… comments? Is it OK to get a little bit excited about ‘just another’ transit of Venus – since it’s only the 7th we have ever recorded data about? Did you know that the plural of ephemeris (the position of something in the sky) is ephemerides? The nearly 7-hour transit begins at 3:09 pm Pacific Daylight Time (22:09 UT) on June 5th. The timing favors observers in the mid-Pacific where the sun is high overhead during the crossing. In the USA, the transit will at its best around sunset. That's good, too. Creative photographers will have a field day imaging the swollen red sun "punctured" by the circular disk of Venus. Observing tip: Do not stare at the sun. Venus covers too little of the solar disk to block the blinding glare. Instead, use some type of projection technique or a solar filter. A #14 welder's glass is a good choice. Many astronomy clubs will have solar telescopes set up to observe the event; contact your local club for details. Venus was the key, according to astronomer Sir Edmund Halley. He realized that by observing transits from widely-spaced locations on Earth it should be possible to triangulate the distance to Venus using the principles of parallax. In retrospect, the experiment falls into the category of things that sound better than they actually are. Bad weather, primitive optics, and the natural "fuzziness" of Venus’s atmosphere prevented those early observers from gathering the data they needed. Proper timing of a transit would have to wait for the invention of photography in the century after Cook’s voyage. In the late 1800s, astronomers armed with cameras finally measured the size of the Solar System as Edmund Halley had suggested. This year’s transit is the second of an 8-year pair. Anticipation was high in June 2004 as Venus approached the sun. No one alive at the time had seen a Transit of Venus with their own eyes, and the hand-drawn sketches and grainy photos of previous centuries scarcely prepared them for what was about to happen. 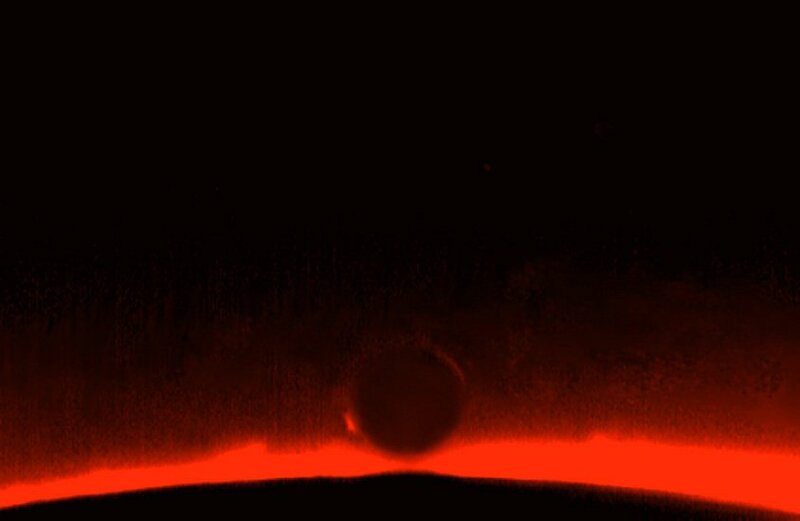 Modern solar telescopes captured unprecedented view of Venus’s atmosphere backlit by solar fire. They saw Venus transiting the sun’s ghostly corona, and gliding past magnetic filaments big enough to swallow the planet whole. One photographer even caught a spaceship, the International Space Station, transiting the sun alongside Venus. A century ago, scientists chased transits of Mercury and Venus in an effort to size up our solar system. Next week, they will use the last Venus transit for a century to learn how to size up other solar systems as we search for life in the universe. NSO will carry out a variety of scientific measurements and make available on the Internet near-real time images of the last transit of Venus to be visible from Earth for over a century on 5-6 June 2012. NSO will use telescopes in Arizona, New Mexico, California, Hawai’i, Australia, and India. Live imagery and more will be available at the NSO Venus Transit website. NSO facilities have observed recent transits of Mercury, but this will be the only time a transit of Venus will be seen by telescopes at Kitt Peak, AZ, and Sacramento Peak, NM. Venus’ thick atmosphere makes this transit event valuable for understanding Venus’ outer atmosphere. Observing the transit of a planet with a known atmospheric composition will provide a benchmark for studying details of exo-planet transits (planets around stars other than the Sun). In like manner, a scientist on the Moon could learn about Earth’s atmosphere as it filters sunlight during a lunar eclipse. For a transit, though, the effect is much smaller, requiring greater precision and care in the measurements. NSO facilities will obtain complementary measurements of the structure of the atmosphere of Venus. These facilities will all look at the strong spectral signatures produced by the abundant CO2 in the atmosphere of Venus. The transit will be visible at four of the six telescopes of the NSO Integrated Synoptic Program (NISP) Global Oscillation Network Group (GONG) helioseismic network that circle the Earth, as well as the NISP Synoptic Optical Long-term Investigations of the Sun (SOLIS) on Kitt Peak. Images and movies from these sites will be processed within minutes of acquisition and available for public viewing on the NSO website. Using the NSO’s largest telescope, the McMath-Pierce Main (McMP), also at Kitt Peak, scientists will map the carbon dioxide atmosphere of Venus at infrared wavelengths using spectropolarimetry. Winds in the atmosphere of Venus will be examined using the Doppler shifts of the CO2 spectral lines, and the polarization of the light from the Venus atmosphere will be used to study particle sizes. Using the McMP West telescope, the linear polarization from the Venus atmosphere will be mapped 25 times a second at different visible colors. Finally, at the McMP East telescope, un-imaged sunlight will be examined with a high-resolution spectrograph in order to duplicate data from night-time observations of exoplanets around other stars. At the 76 cm Richard B. Dunn Solar Telecope (DST) on Sacramento Peak, NM, related observations of CO2 lines in the visible and infrared wavelengths will be obtained with spectrographs, imaging spectrometers, and high-speed imaging systems provided by a variety of partners and international institutes. The powerful adaptive optics system at the DST will correct atmospheric distortions and allow the instruments to capture some of the highest resolution images possible of the transit. In addition to scientific studies, the transit will provide information that will be used to improve the overall quality of NSO observations. For example, these images can be used to calibrate the amount of scattered light and the exact orientation of the cameras within instruments such as the NISP Full Disk Patrol. 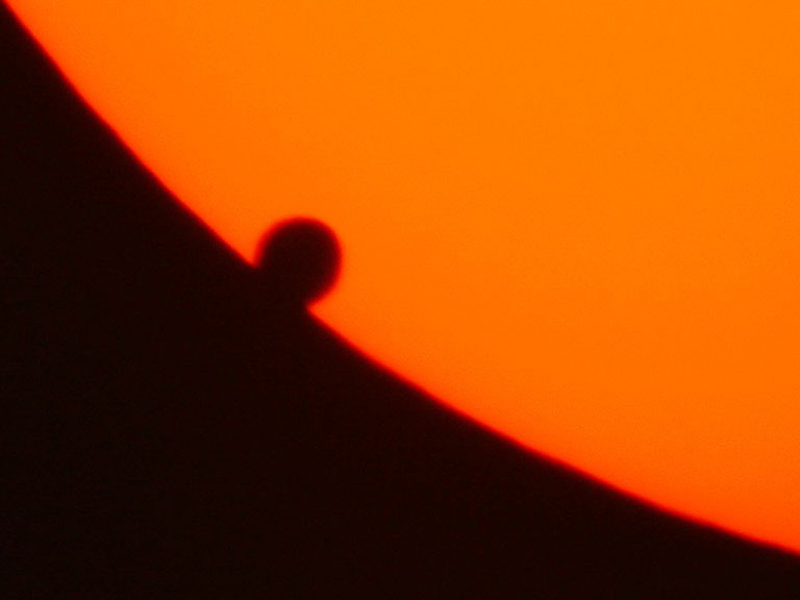 The transit will occur in late afternoon in the continental US and will be easily visible with the proper filters or projection techniques. In 1768, when James Cook sailed out of Plymouth harbor to observe the Transit of Venus in Tahiti, the trip was tantamount to a voyage through space. The remote island had just been "discovered" a year earlier, and by all accounts it was as strange and alien to Europeans as the stars themselves. Cook's pinpoint navigation to Tahiti and his subsequent observations of Venus crossing the South Pacific sun in 1769 have inspired explorers for centuries. One of those explorers is about to beat Cook at his own game. "I've been planning this for a while," says Pettit, who serves as Flight Engineer onboard the International Space Station. "I knew the Transit of Venus would occur during my rotation, so I brought a solar filter with me when my expedition left for the ISS in December 2011." 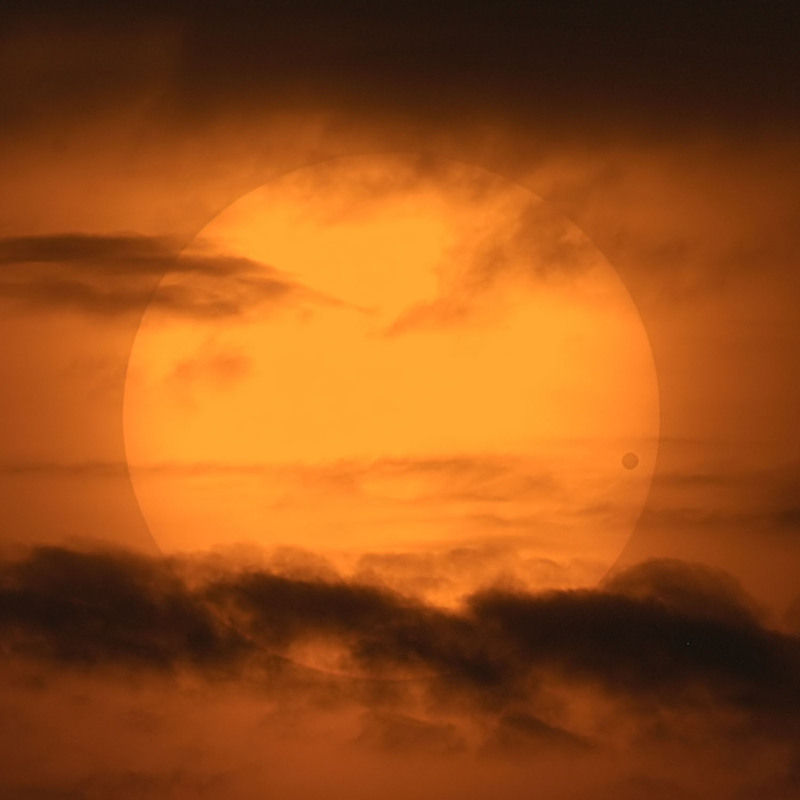 "The Expedition 31 crew will be the first people in history to see a Venus transit from space, and Pettit will be the first to photograph one," says Mario Runco, Jr. of the Johnson Space Center (JSC). Runco, an astronaut himself who flew aboard three shuttle missions, is an expert in the optics of spacecraft windows. Along with his wife Susan Runco, who is the coordinator for astronaut photography at JSC, Mario is helping Pettit gather the best possible images of the transit. Pettit will be pointing his camera through the side windows of the space station's cupola, an ESA-built observatory module that provides a wide-angle view of Earth and the cosmos. Its seven windows are used by the crew to operate the station's robotic arm, coordinate space dockings, and take science-grade photos of the Earth and sky. It's also a favorite "hangout" for off-duty astronauts who find the view exhilarating. "For this transit, Don will be removing the non-optical quality, internal protective window panes known as 'scratch panes,' which really make crisp, sharp, and clear images impossible," says Runco. "Removing those panes is a huge plus when it comes to details that will be seen in the imagery of the sun." Pettit describes the camera system: "I'll be using a high-end Nikon D2Xs camera and an 800mm lens with a full-aperture white light solar filter." "Even with this great camera system, the images would be quite soft if the scratch panes were not removed," notes Runco. "This is only the third time that we'll be [shooting through] the Cupola's optical quality windows. I'm hoping this becomes routine in the future." This month's transit is the bookend of a 2004-2012 pair. Astronauts were onboard the ISS in 2004, but they did not see the transit, mainly because they had no solar filters onboard. Tiny Venus covers a small fraction of the solar disk, so the sun is still painfully bright to the human eye even at mid-transit. Pettit's foresight to bring a solar filter with him makes all the difference. How would Cook feel about all this? "I don't think James Cook should be too envious," says Runco. "After all, he did get an all-expense paid trip to Tahiti out of the deal." Don's photos will be rapidly posted to the web during the transit. The historic webcast begins on June 5th at approximately 3 pm PDT. On June 5, 2012 at 6:03 PM EDT, the planet Venus will do something it has done only seven times since the invention of the telescope: cross in front of the sun. This transit is among the rarest of planetary alignments and it has an odd cycle. Two such Venus transits always occur within eight years of each other and then there is a break of either 105 or 121 years before it happens again. The moments when Venus first appears to cross the limb of the sun and the moments it leaves, known as ingress and egress respectively, are historically the most scientifically important aspects of the transit since comparison of Venus's journey viewed from different points on Earth provided one of the earliest ways to determine the distance between Earth and the sun. The transit is also helpful to scientists today: NASA's Solar Dynamics Observatory (SDO) will be watching the June 2012 transit to help calibrate its instruments as well as to learn more about Venus's atmosphere. Since the points at which Venus will first touch and later leave the sun is known down to minute detail, SDO can use this information to make sure its images are oriented to true solar North. Orienting instruments is a constant adjustment game for telescopes in space, since their original position can be shifted during launch. Various calibrations throughout the two years SDO has been in space have left the scientists confident that the instruments are highly accurate, but making sure that Venus appears in the SDO images exactly where scientists know it should be will help make sure SDO's orientation is accurate to within a tenth of a pixel. Second, the SDO team can use the lightless center of Venus to help calibrate what is called the point spread function of the telescope. This function describes how much light leaks from one pixel into others around it. Since there is no light emitted from the very center of Venus as it crosses the sun, it serves as a perfect test case for an area of the image where the pixels should remain black. By measuring how much light bleeds into those pixels from the rest of the sun, the SDO team will have a better sense of how to correct for that. These measurements also help us to understand the black drop effect – in which a tiny black spot appears to connect Venus to the limb of the sun -- that bedeviled scientists' attempts to measure the exact position of Venus during transits in the 18th and 19th centuries. And last, the SDO team hopes to learn more about Venus's atmosphere as it is partially transparent to the extreme ultraviolet light observed by the telescopes on SDO. Venus will appear to be a little bigger in longer wavelengths (such as 304) as compared to shorter wavelengths (such as 171). This difference tells us how much oxygen is in Venus’s atmosphere. A Venus transit across the face of the sun is a relatively rare event -- occurring in pairs with more than a century separating each pair. There have been all of 53 transits of Venus across the sun between 2000 B.C. and the last one in 2004. On Wednesday, June 6 (Tuesday, June 5 from the Western Hemisphere), Earth gets another shot at it - and the last for a good long while. But beyond this uniquely celestial oddity, why has Venus been an object worthy of ogling for hundreds of centuries? "Venus is a fascinating yet horrendously extreme place all at once," said Sue Smrekar, a scientist at NASA's Jet Propulsion Laboratory in Pasadena, Calif. "Although the surface is hot enough to melt lead due to its runaway greenhouse atmosphere, in many respects it is Earth's twin [size, gravity and bulk composition]." Venus is not only nearby, but its orbit brings it closest to Earth of all the planets. Which along with its bright atmosphere goes a long way toward making it the third brightest object in the sky (the sun and moon are one and two). Along with Smrekar and many other equally intrigued planetary scientists, you can add to the list of those studying the second planet from the sun the ancient Babylonians, who noted its wanderings in texts as far back as 1600 BC. And anyone who has ever sweated out a Pythagorean Theorem in school (A2+B2=C2) might find some solace in knowing that Greek mathematician Pythagoras sweated out the orbits of Venus, eventually becoming the first to determine that what had been believed to be unique and separate evening and morning stars (as believed by the ancient Egyptians and Greeks), was actually just one object - Venus. But for all that these ancient astronomers and their medieval contemporaries (including the Aztecs back in the 1500s) were able to deduce, no human had ever laid eyes on Venus as more than a bright dot in the sky until Galileo Galilei, who in 1610 was the first human to actually see Venus in various kinds of light. With his telescope, Galileo started cranking out Venetian discoveries, including how the planet changed its illumination phase just like the moon as it circles Earth. Galileo's telescope provided strong evidence that Venus goes around the sun, and not Earth, as most of his contemporaries believed. After Galileo, Venus came under even more intense scrutiny, both scientific and fanciful. More than one astronomer (and science fiction author) theorized it was home to some type of life form. The thick, impenetrable clouds allowed them to imagine tropical environs with steady rainfall and lush vegetation. With the dawn of robotic space probes, America's Mariner 2, built by JPL, became history's first interplanetary traveler when it flew past Venus on Dec. 14, 1962. All told, 45 missions targeting Earth's twin have been launched by the United States, Russia (and former Soviet Union), and Japan. All this probing by astronomers and robotic explorers has found Venus to be replete with 900-degree-Fahrenheit (500-degree-Celsius) temperatures in a carbon-dioxide-rich atmosphere with pressures equivalent to being half a mile below the ocean surface. It is not a particularly hospitable environment. "If our research tells us anything, it is that while Venus is devoid of life, it should be anything but avoided," said Smrekar. "Throughout history, Venus has been one of the most studied and speculated-about celestial bodies in our sky, and the same truth will hold well after this transit is over. Venus is a remarkable world with many lessons for us about the climate and interior of Earth and Earth-like planets in other solar systems." If you're in the western Pacific, eastern Asia and eastern Australia, you'll get a great view of the entire event. North and Central America, and northern South America get the beginning of the transit (on June 5), but the sun will set before the event ends. Conversely, Europeans, as well as those watching in western and central Asia, eastern Africa and western Australia will get a glimpse at the tail end. City odors drifted in from Plymouth, across the ship, shoving aside the salt air. Sea gulls fluttered upward, screeching, as the sails snapped taut. The wind had changed and it was time to go. On August 12, 1768, His Majesty's Bark Endeavour slipped out of harbor, Lt. James Cook in command, bound for Tahiti. The island had been "discovered" by Europeans only a year before in the South Pacific, a part of Earth so poorly explored mapmakers couldn't agree if there was a giant continent there or not. Cook might as well have been going to the Moon or Mars. He would have to steer across thousands of miles of open ocean, with nothing like GPS or even a good wristwatch to keep time for navigation, to find a speck of land only 20 miles across. On the way, dangerous storms could (and did) materialize without warning. Unknown life forms waited in the ocean waters. Cook fully expected half the crew to perish. "At 2 pm got under sail and put to sea having on board 94 persons," Cook noted in his log. The ship's young naturalist Joseph Banks was more romantic: "We took our leave of Europe for heaven alone knows how long, perhaps for Ever," he wrote. Their mission was to reach Tahiti before June 1769, establish themselves among the islanders, and construct an astronomical observatory. Cook and his crew would observe Venus gliding across the face of the Sun, and by doing so measure the size of the solar system. Or so hoped England's Royal Academy, which sponsored the trip. The size of the solar system was one of the chief puzzles of 18th century science, much as the nature of dark matter and dark energy are today. In Cook's time astronomers knew that six planets orbited the sun (Uranus, Neptune, and Pluto hadn't been discovered yet), and they knew the relative spacing of those planets. Jupiter, for instance, is 5 times farther from the Sun than Earth. But how far is that … in miles? The absolute distances were unknown. Venus was the key. Edmund Halley realized this in 1716. As seen from Earth, Venus occasionally crosses the face of the sun. It looks like a jet-black disk slowly gliding among the sun's true spots. By noting the start- and stop-times of the transit from widely spaced locations on Earth, Halley reasoned, astronomers could calculate the distance to Venus using the principles of parallax. The scale of the rest of the solar system would follow. But there was a problem. Transits of Venus are rare. They come in pairs, 8 years apart, separated by approximately 120 years. Halley himself would never live to see one. An international team did try to time a Venus transit in 1761, but weather and other factors spoiled most of their data. If Cook and others failed in 1769, every astronomer on Earth would be dead before the next opportunity in 1874. Cook's expedition is often likened to a space mission. "The Endeavor was not only on a voyage of discovery," writes Tony Horwitz in the Cook travelogue Blue Latitudes, "it was also a laboratory for testing the latest theories and technologies, much as spaceships are today." In particular, the crew of the Endeavor were to be guinea pigs in the Navy's fight against "the scourge of the sea"--scurvy. The human body can store only about 6 week's worth of vitamin C, and when it runs out seamen experience lassitude, rotted gums, hemorrhaging. Some 18th century ships lost half their crew to scurvy. Cook carried a variety of experimental foods onboard, feeding his crew such things as sauerkraut and malt wort. Anyone who refused the fare would be whipped. Indeed, Cook flogged one in five of his crew, about average in those days, according to Horwitz. By the time Cook reached Tahiti in 1769, he'd been sailing west for 8 months--about as long as modern astronauts might spend en route to Mars. Five crewmen were lost when the ship rounded stormy Cape Horn, and another despairing marine threw himself overboard during the 10-week Pacific passage that followed. Endeavor was utterly vulnerable as it angled toward Tahiti. There was no contact with "Mission Control," no satellite weather images to warn of approaching storms, no help of any kind. Cook navigated using hourglasses and knotted ropes to measure ship's speed, and a sextant and almanac to estimate Endeavor's position by the stars. It was tricky and dangerous. Remarkably, they arrived mostly intact on April 13, 1769, almost two months before the transit. "At this time we had but very few men upon the Sick list … the Ships compney had in general been very healthy owing in a great measure to the Sour krout," wrote Cook. Tahiti was as alien to Cook's men as Mars might seem to us today. At least the island was comfortable and well provisioned for human life; the islanders were friendly and eager to deal with Cook's men. Banks deemed it "the truest picture of an arcadia (idyllic and peaceful) … that the imagination can form." Yet the flora, fauna, customs and habits of Tahiti were shockingly different from those of England; Endeavor's crew was absorbed, amazed. Perhaps that is why Cook and Banks had so little to say about the transit when it finally happened on June 3, 1769. Venus' little black disk, which could only be seen gliding across the blinding sun through special telescopes brought from England, had a powerful rival: Tahiti itself. Banks' log entry on the day of the transit consists of 622 words; fewer than 100 of them concern Venus. Mostly he chronicled a breakfast-meeting with Tarróa, the King of the Island, and Tarróa's sister Nuna, and later in the day, a visit from "three handsome women." Of Venus, he says, "I went to my Companions at the observatory carrying with me Tarróa, Nuna and some of their chief attendants; to them we shewd the planet upon the sun and made them understand that we came on purpose to see it. After this they went back and myself with them." Period. If the King or Banks himself was impressed, Banks never said so. Cook was a little more expansive: "This day prov'd as favourable to our purpose as we could wish, not a Clowd was to be seen … and the Air was perfectly clear, so that we had every advantage we could desire in Observing the whole of the passage of the Planet Venus over the Suns disk: we very distinctly saw an Atmosphere or dusky shade round the body of the Planet which very much disturbed the times of the contacts particularly the two internal ones." Cook also observed the "black drop effect." When Venus is near the limb of the sun--the critical moment for transit timing--the black of space beyond the sun's limb seems to reach in and touch the planet. This makes it very difficult to say precisely when a transit begins or ends. The effect was not fully understood until 1999 when a team of astronomers led by Glenn Schneider of the University of Arizona studied a similar black drop during a transit of Mercury. They proved1 the distortion is caused by a combination of solar limb darkening and the point-spread function of the telescope. Cook's observations were clearly affected. Indeed, his measurements disagreed with those of ship's astronomer Charles Green, who observed the transit beside Cook, by as much as 42 seconds. This was a problem for observers elsewhere, too. When all was said and done, observations of Venus' 1769 transit from 76 points around the globe, including Cook's, were not precise enough to set the scale of the solar system. Astronomers didn't manage that until the 19th century when they used photography to record the next pair of transits. Cook wouldn't dwell on these matters; there was a lot more exploring to do. Secret orders from the Navy instructed him to leave the island when the transit was done and "search between Tahiti and New Zealand for a Continent or Land of great extent." For much of the next year Endeavor and her crew scoured the South Pacific, searching for a continent that some 18th century scientists claimed was necessary to balance the great land masses of the northern hemisphere. At one point they were out of sight of land for almost two months. But the terra australis incognita, the unknown "south land," didn't exist, just as Cook thought all along. Along the way Cook met the fierce Maori of New Zealand and the Aborigines of Australia (encounters both races would lament in later years), explored thousands of miles of Kiwi and Aussie coastline, and had a near-disastrous collision with the Great Barrier Reef. Later, during a 10-week stopover in Jakarta for repairs, seven seamen died of malaria. The port city was densely populated by people and diseases. Cook left as quickly as possible, but the damage was done. Ultimately 38 of the Endeavour's original company (and 8 who joined later) perished, including astronomer Charles Green. "The ship's 40% casualty rate wasn't considered extraordinary for the day," writes Horwitz. "In fact, Cook would later be hailed for the exceptional concern he showed for the health of his crew." On July 11, 1771, Cook returned to England at Deal. The survivers had circumnavigated the globe, catalogued thousands of species of plants, insects and animals, encountered new (to them) races of people, and hunted for giant continents. It was an epic adventure. In the end, the transit was just a tiny slice of Cook's adventure, overshadowed by Tahiti and sabotaged by black drops. But because of the voyage Venus and Cook are linked. In fact, it might be said that the best reason to watch a transit of Venus is history. Decide for yourself. On June 5-6, 2012, Venus is due to cross the face of the Sun again. The event will be web cast, broadcast, and targeted by innumerable sidewalk telescopes. In other words, you can't miss it. Look into the inky black disk. It can carry you back to a different place and time: Tahiti, 1769, when much of Earth was still a mystery and the eye at the telescope belonged to a great explorer. "I was flabbergasted when I first saw it during the 2004 transit," recalls astronomy professor Jay Pasachoff of Williams College. "A bright, glowing rim appeared around the edge of Venus soon after it began to move into the sun." For a brief instant, the planet had turned into a "ring of fire." Researchers now understand what happened. Backlit by the sun, Venus's atmosphere refracted sunlight passing through layers of air above the planet's cloudtops, creating an arc of light that was visible in backyard telescopes and spacecraft alike. "We do not understand why our sister planet's atmosphere evolved to be so different than Earth's," explains planetary scientist Thomas Widemann of the Observatoire de Paris. Earth and Venus are similar distances from the sun, are made of the same basic materials, and are almost perfect twins in terms of size. Yet the two planets are wrapped in stunningly dissimilar blankets of air. Venus's atmosphere is almost 100 times more massive than Earth's and consists mainly of CO2, a greenhouse gas that raises the surface temperature to almost 900°F. Clouds of sulfuric acid tower 14 miles high and whip around the planet as fast as 220 mph. A human being transported to this hellish environment would be crushed, suffocate, desiccate, and possibly ignite. "Our models and tools cannot fully explain Venus, which means we lack the tools for understanding our own planet," points out Widemann. "Caring about Venus is caring about ourselves." One of the biggest mysteries of Venus is super-rotation. The whole atmosphere circles the planet in just four Earth days, much faster than the planet's spin period of 243 days. "The dynamics of super-rotation are still a puzzle despite a wealth of data from landmark missions such as NASA's Pioneer Venus, Russia's Venera and VEGA missions, NASA's Magellan and more recently ESA's Venus Express." This is where the Arc of Venus comes in. The brightness of the arc reveals the temperature and density structure of Venus's middle atmosphere, or "mesosphere," where the sunlight is refracted. According to some models, the mesosphere is key to the physics of super-rotation. By analyzing the lightcurve of the arc, researchers can figure out the temperature and density of this critical layer from pole to pole. This time, however, they are ready. 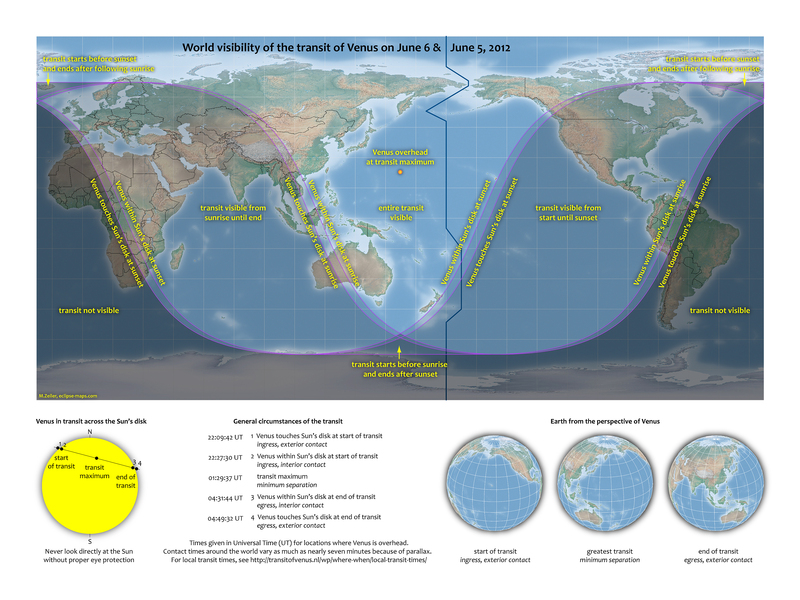 Together, Pasachoff and Widemann have organized a worldwide effort to monitor the phenomenon on June 5th, 2012. "We're going to observe the arc using 9 coronagraphs spaced around the world," says Pasachoff. "Observing sites include Haleakala, Big Bear, and Sacramento Peak. 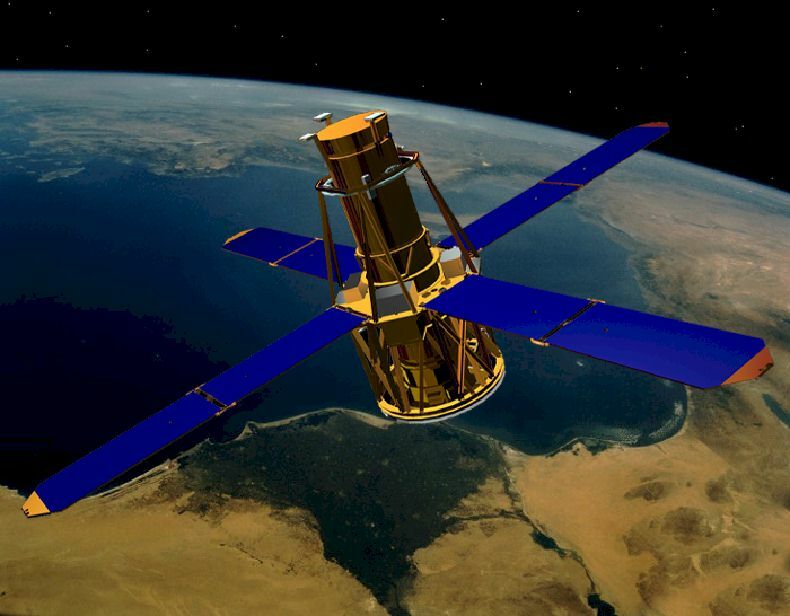 Japan's Hinode spacecraft and NASA's Solar Dynamics Observatory will also be gathering data." Pasachoff has some advice for amateur astronomers who wish to observe the arc. "The best times to look are ingress and egress--that is, when the disk of Venus is entering and exiting the sun. Ingress is between 22:09 and 22:27 UT on June 5th; egress occurs between 04:32 and 04:50 UT. Be sure your telescope is safely filtered. Both white light and H-alpha filters might possibly show the arc." Watch the 2012 Transit of Venus Live!